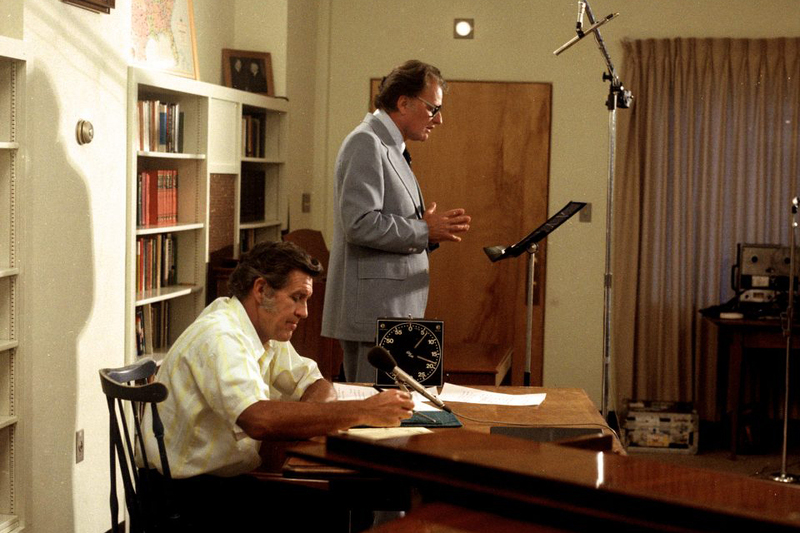 Cliff Barrows and Billy Graham record The Hour of Decision radio program, which aired on hundreds of radio stations between 1950 and 2014. Mr. Barrows passed away on Nov. 15, 2016. Visit the Cliff Barrows memorial website. 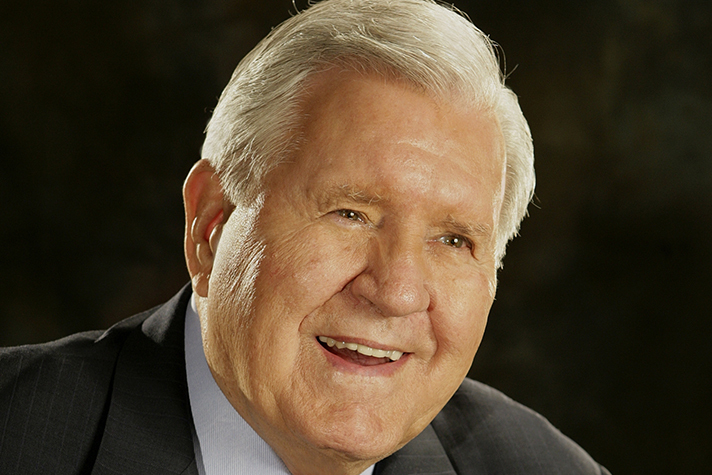 Cliff Barrows dedicated his life to sharing the love of Jesus Christ with the world. Known for his humility, his servant’s heart and his daily walk with Christ, Mr. Barrows was part of the Billy Graham Evangelistic Association since it was founded in 1950. Billy Graham once wrote of his longtime friend and ministry partner: “I love him like a brother.” Mr. Barrows went to be with the Lord on Nov. 15, 2016. He will be sorely missed. Cliff Barrows was on his honeymoon in the mountains of North Carolina when he first met a young preacher named Billy Graham. It was 1945, and the evangelist had a bit of a dilemma. He was scheduled to preach at a Youth for Christ rally in Asheville, North Carolina, and his song leader wasn’t there. Barrows, who was visiting from California with his new wife, Billie, agreed to step in and lead the music. It was the beginning of a lifetime of ministry partnership—and a friendship for the ages. More than 70 years after that first encounter with Billy Graham, Cliff Barrows was still serving God as an integral part of the Billy Graham Evangelistic Association. 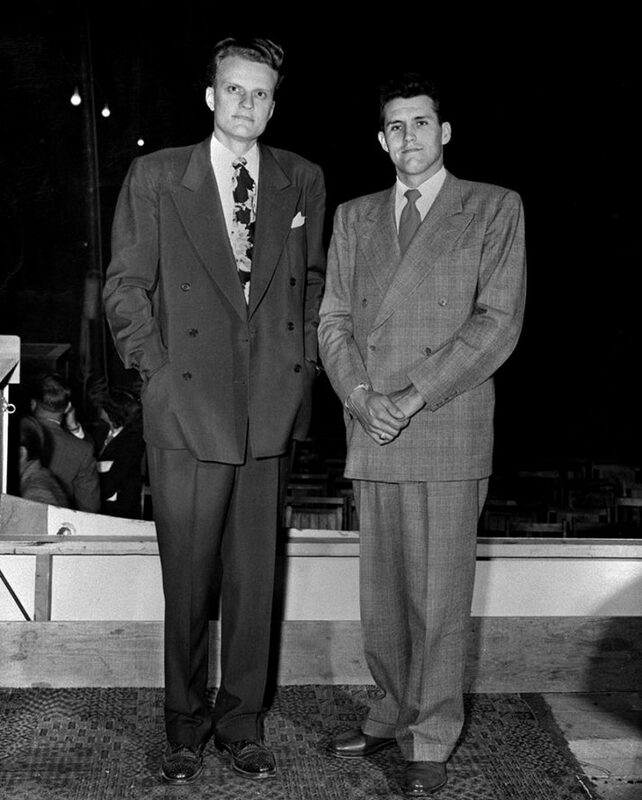 Cliff Barrows and Billy Graham in the late 1940s. >>View more photos of Cliff Barrows through the years. Just a few weeks before he passed away at age 93, Mr. Barrows recorded several sessions of the Hour of Decision Online—a rebirth of The Hour of Decision radio program, which he hosted from 1950 to 2014 and which was heard on more than 500 radio stations around the world. In the final episode of the program recorded by Mr. Barrows before his death, his voice rang out, full of warmth and joy. Cliff Barrows directs a Billy Graham Crusade choir in 1964. 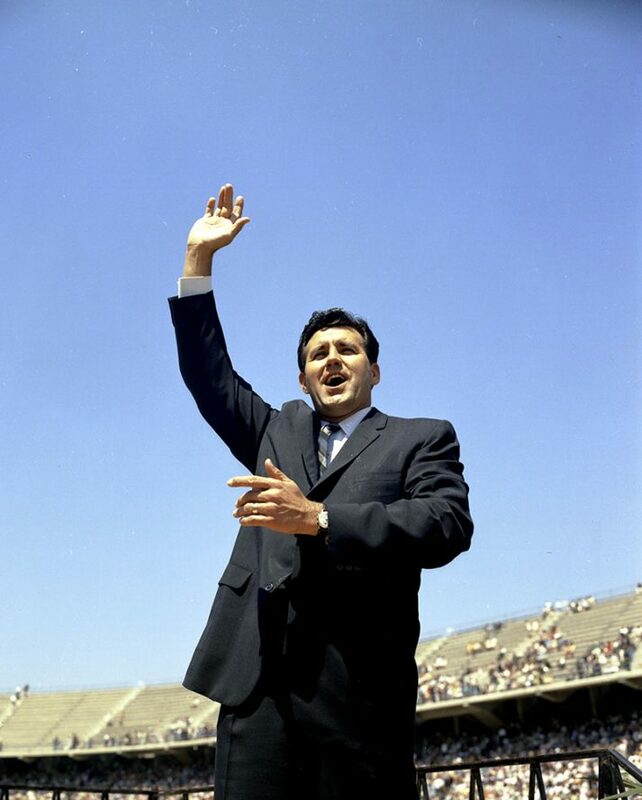 The episode featured a message from Billy Graham called “The Cross of Christ,” which he shared at the 1957 Crusade in New York City—the longest-running Crusade in BGEA history, lasting nearly four months. “It was such a thrilling time,” Mr. Barrows recalled. That summer at Madison Square Garden, more than 2 million people heard the Gospel. It was also during that time that the classic hymn “How Great Thou Art” found its way into the hearts of the American people. As George Beverly Shea’s voice crooned those now-famous lyrics, Cliff Barrows was onstage leading the choir, preparing hearts to hear Billy Graham preach the Gospel. More than 60,000 people made a public profession of faith in Christ that summer in the heart of New York City. 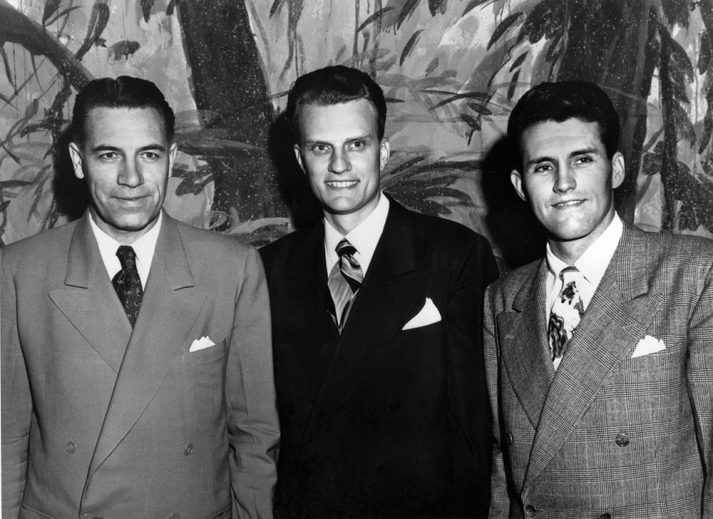 (From left to right) George Beverly Shea, Billy Graham and Cliff Barrows in the late 1940s. How do you describe a friendship that spanned 60 years, six continents and millions of souls reached for Christ? The love, respect and camaraderie among Billy Graham, George Beverly Shea and Cliff Barrows stood the test of time. 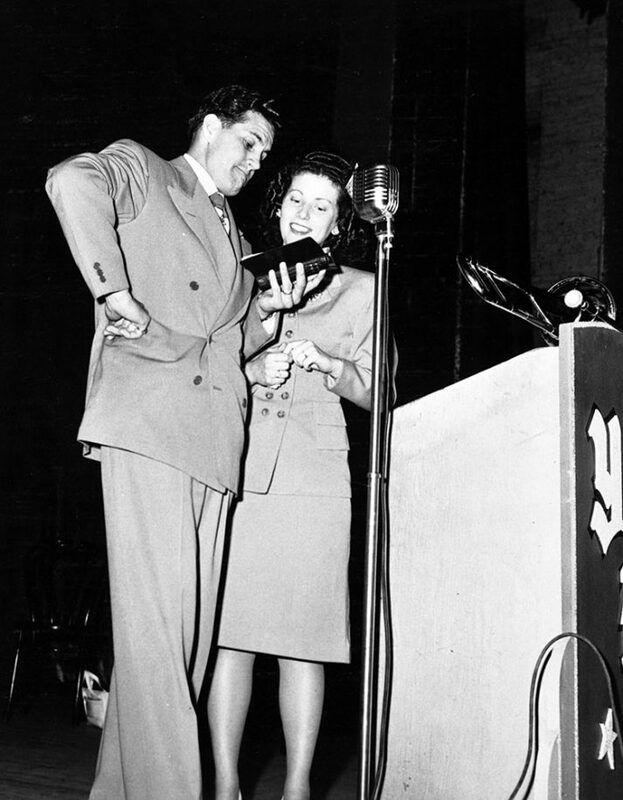 Together, the preacher, the soloist and the song leader formed the trio at the heart of Billy Graham Crusades, radio programs and television broadcasts from the 1940s until Bev Shea passed away in 2013 at the age of 104. That once-vibrant trio is now down to one, and Mr. Graham, who just turned 98, has lost a beloved friend. 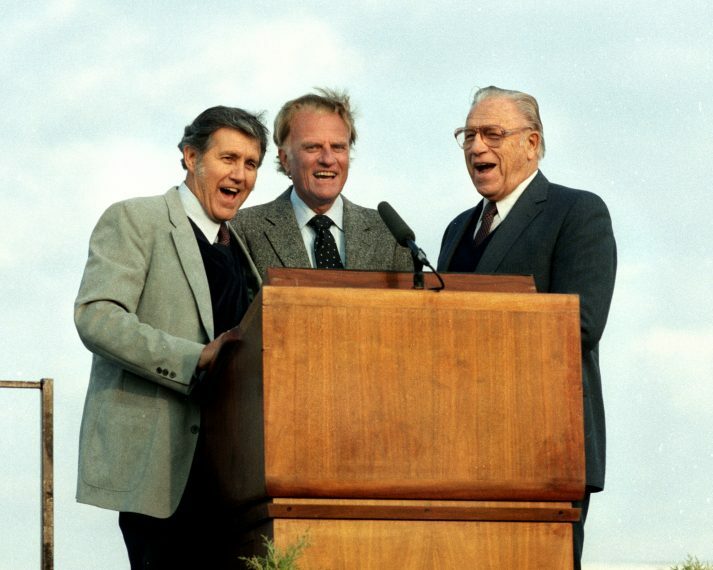 Cliff Barrows (left), Billy Graham (center) and George Beverly Shea (right) together in 1984. “But all of that talent is not the secret of Cliff’s effectiveness,” he wrote. “It is his humility and his willingness to be a servant, which spring from his devotional life and his daily walk with Christ. At Billy Graham’s 95th birthday celebration in 2013, he only spoke for a few moments, but he made sure to acknowledge his longtime friend. From the earliest days of Billy Graham’s ministry, Cliff and Billie Barrows were at the heart of the team, serving alongside Billy and Ruth Graham. Cliff and Billie Barrows, mid-1940s. As newlyweds, the Barrows traveled with the Grahams to war-torn Europe, sharing the hope of the Gospel at 360 meetings in dozens of cities throughout Great Britain between October 1946 and March 1947. The young evangelists would not be deterred, and it seems the adversity only brought them closer. Through the years, the two couples formed a tight bond as they served together and watched each others’ families grow. The Barrows had five children: Bonnie, 1948; Robert, 1950; Betty Ruth, 1953; Clifford (Bud), 1955; and William Burton, 1962. When Billie Barrows died of cancer in 1994, the Grahams wept and mourned alongside their friend. Mr. Barrows had lost his partner of 50 years. 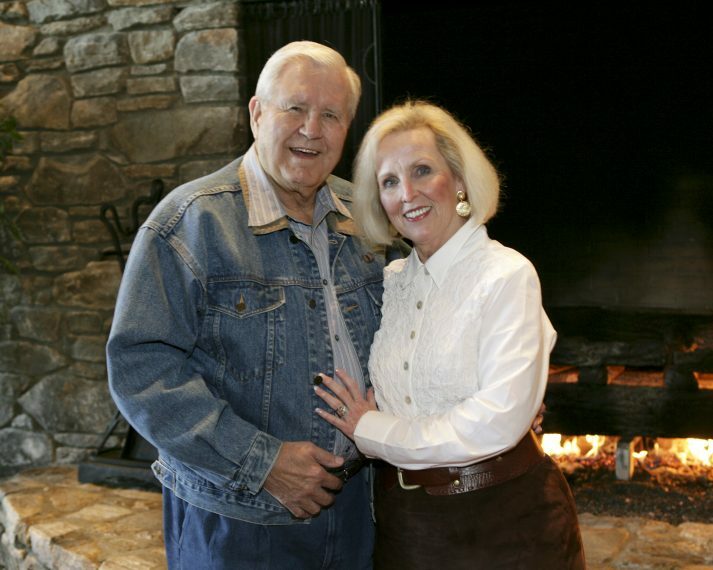 Cliff Barrows and his wife, Ann, in a 2007 photo. Mr. Barrows was married to his first wife, Billie, for nearly 50 years. God brought him and Ann together after they both lost their spouses to cancer. God, in his grace, brought Ann Prince into Mr. Barrows’ life after both of their spouses succumbed to cancer. The two were married, and they served the Lord together for more than 20 years. As Mr. Barrows’ eyesight failed in the later years of his life, Mrs. Barrows took care of him in a thousand big and little ways. Cliff Barrows will be remembered for his joyful spirit, his tender heart and above all, his love of Christ. His desire to see others know Jesus as their Savior is something that marked his life until the end. as you trust Him and walk in His way. May His presence within guard and keep you from sin. Go in peace; go in joy; go in love. “This program has come to you through the auspices of the Billy Graham Evangelistic Association. Cliff Barrows will be remembered for exuding the joy of Christ. You can have lasting joy and peace through a relationship with Christ. Take the first step. Visit the Cliff Barrows memorial website to view photos, share memories or to give a gift in Mr. Barrows’ honor.